Shey – PhoksudoNational park is situated in the mountain region of Western Nepal covering parts of Dolpo and Magu districts. Gazetted in 1984, it is the largest national park in the country with an area of 3555Sq. km. 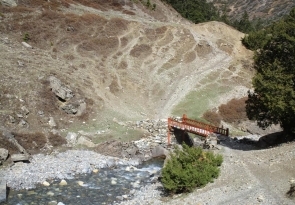 The main objectives of the park are to preserve the unique Trans-Himalayan ecosystem, its typical Tibetan type of flora and fauna, and to protect endangered species such as the Snow leopard, Blue sheep (only found Shey Gomba and Dolphu), Goral, Himalayan Tahr, Wolf, Jackal,Himalaya Black Bear, Himalayan Weasel, Himalayan mouse Hare, Yellow-throated Marten, Langur, musk deer and Rhesus Monkeys. About the local communities, there are several settlements in the park, totaling an approximate population of 2000. 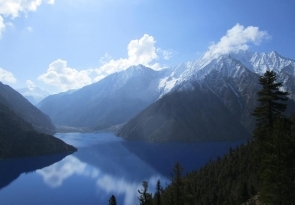 The people’s lifestyle and culture are strongly reminiscent of Tibet. Local inhabitants believe in the Buddhist religion but the community of Phoksundo area practices Bon, a pre- Buddhist sect. Almost all villages have their own communal gompas. 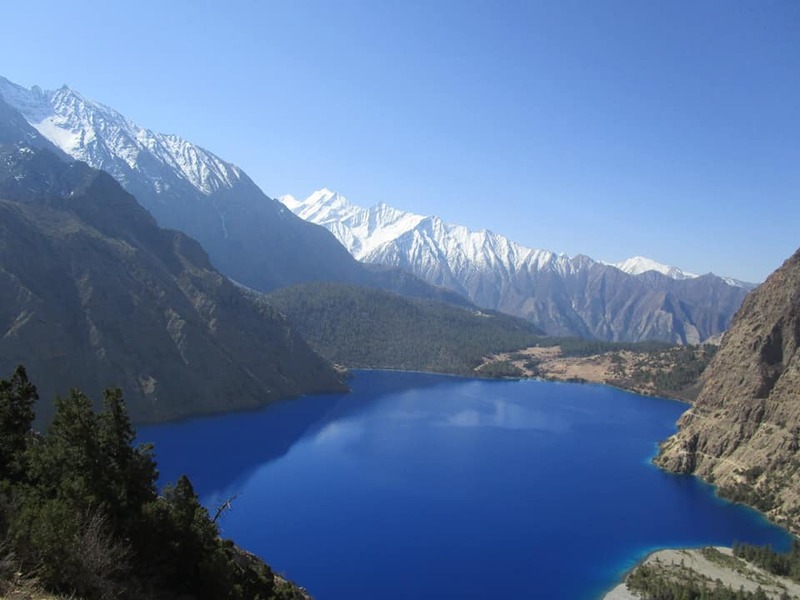 Highlights: Dolpa is the most remote and least developed isolated corner of Nepal, The region offers opportunities to visit ancient villages, high passes, beautiful Lakes, isolated Buddhist monasteries and also experience the vast array of wildlife inhabiting the region, including Blue sheep, Mountain Goat, Jackal, Wolf and the legendary Snow Leopard. 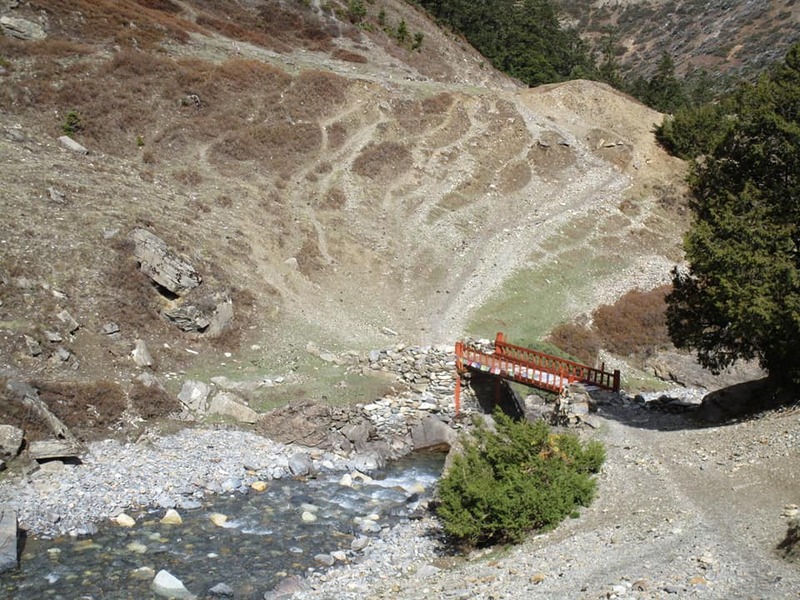 From the camp at Dunai, route diverts from the King Mahendra statue to cross the new suspension bridge and turning west, following the trail past the hospital. 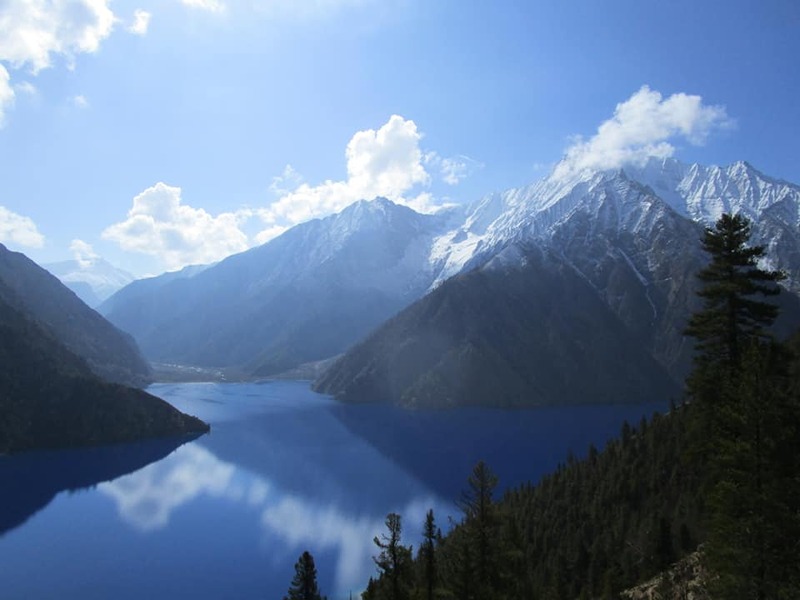 The path soon begins to climb up the side of the treeless Thulo Bheri valley, where it crests a ridge and then enters the Phoksundo river valley, finally reaching another ridge which is marked by cairns. During the walk can be seen the excellent view of the Kagmara Peak up the valley. This wonderful walk leads to a large side canyon, then descending gently on the long downhill slope through the scattered houses and walnut groves to a stream at 2,810m/9,217ft the trail below the stream leads to Dhera, a winter settlement where people from higher villages keep herds of cows and goats, however, the route leads the upper trail climbing to Rahagaon, a Thakuri village at 2,900m, where there is a Gompa dedicated to the local god, Mastha, guardians of this village. Trek from here passes through the lower part of Rahagaon and then descending to the village water supply at the Phoksundo Khola. Passing through another canyon, the path heads downhill through deep dark forests to a large stream, finally emerging at the entrance to the Shey Phoksundo National Park at Ankhe (2,660m). The journey from this camp leads to small ups and downs along the forested riverbed, then ascending steeply to about 2,900m. The ups and downs can begin to get a bit monotonous, but there are several streams along the way that offer a chance to cool off. The trail eventually leaves the forests and traverses a grassy slope high above the river. After a while, the path once begins to descend steeply into the forest until it reaches a cliff, whereby a dizzying drop on a wobbly stone staircase to the river bank has to be undertaken. You can almost look down between your toes to see the fast-flowing river below. After reaching the river at 2,950m, the trail becomes a collection of rocks and sticks that form a dike along the river bank. It’s hard to imagine how the local people bring their yaks and cows along this trail, but they do. 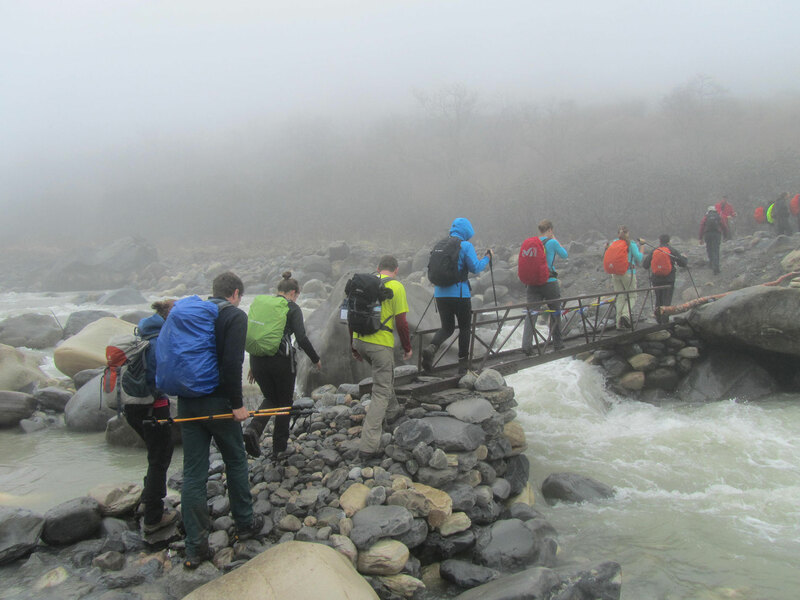 The journey continues upstream to a bridge near Ryajik village for the overnight camp 3,500m, after a good day’s walk. 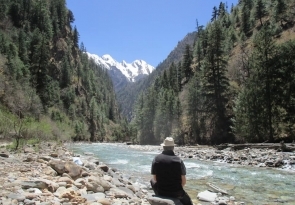 The journey continues along the valley floor to the confluence of the Phoksundo and Pungmo Kholas. After crossing to the western side of the Phoksundo Khola on a wooden bridge, then the path follows the west bank of the Pungmo Khola which leads all the way to Phoksundo Lake 3,500m near Ringmo village. The path passes through a cedar forest and finally to Palam, a winter settlement used by the people of Ringmo village. The houses here are almost buried in the sandy soil. From here our route heads up to open country, at an altitude of around 3,350m. From the ridge, one can see the distant views of Phoksundo Lake and a spectacular 300m high waterfall, one of the highest in Nepal. 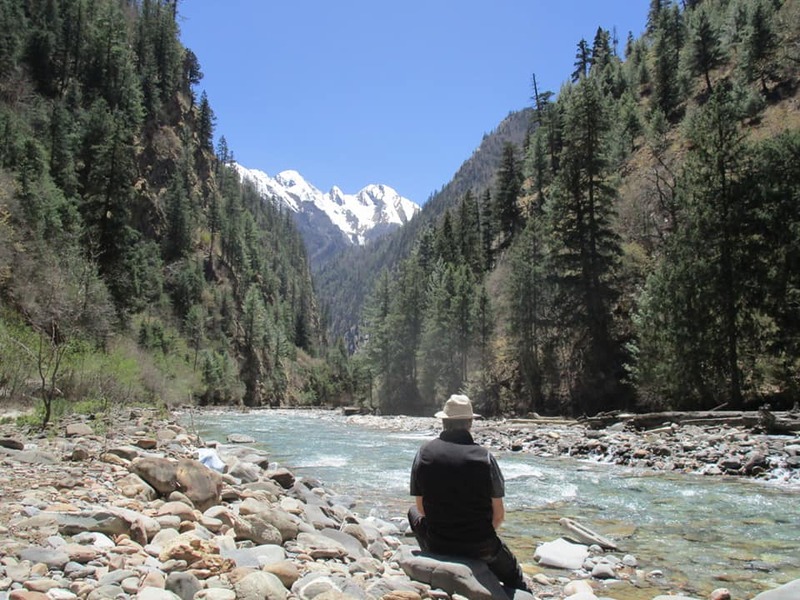 After a brief stop here with the great views, finally, the walk descent through birch forests to the upper reaches of the Phoksundo Khola, and then to the picturesque settlement of Ringmo with its mud plastered Chortens and mani walls. 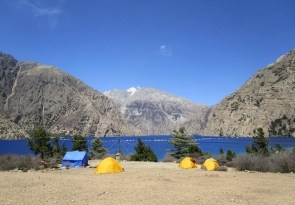 From here it is a short walk to the shores of Phoksundo Lake for the overnight at camp. A well-deserved rest day free from packing, at Phoksundo we can go for a short hike to the village of Ringmo and its Tibetan Buddhist Monastery is well worth a visit. Today’s first hour walk leads along the level path through a glacial valley that now heads due north. At the confluence of the Phoksundo Khola and another mountain stream, there is an old wooden bridge. Here taking the barely distinct path to the north-east of the valley. There is no trail as such, so it is necessary to clamber over the rocks and boulders and to ford a stream that rushes down the steep valley. A long climb brings us to a sheep meadow where the trail veers up a steep ravine. A hard climb to the top brings to yet another valley where one can see the Kang-La, the pass which will lead towards Shey Gompa. Overnight camp will be just before the pass in a place that Peter Matthiessen christened ‘Snowfields Camp. Today from this camp path follows an indistinct trail to the village of Lalberi. Then passing through an area of impressive forest, before descending into another gorge our walk continue following the river again downstream to reach Tarakot where colourful terraced fields greet us. Tarakot (2,537m) is an old fortress town known by the local people as Dzong, meaning ‘fort’. Before the Gorkha dynasty Tarakot was the capital and had a dzong. The famous Sandul gompa lies about 8 km east of Tarakot and at the junction of Barbung Khola and Tarap Chu. It stands on a knoll to the south of Bheri River and at one time supervised collections of tolls for the trading caravans traversing an area called Tichu Rong. It is possible to camp by the river about 150 meters below Tarakot, near the police post or we climb a steep hill for over an hour to the small village on a spur on the other side of a valley opposite Tarakot. There are chortens and a gompa here on the edge of a grassy plateau, with an interesting solitary tree. Rest day in Kathmandu for shopping. In March 2018 my girlfriend and I did a trek in the Everest region to EBC and Kala Pattar. 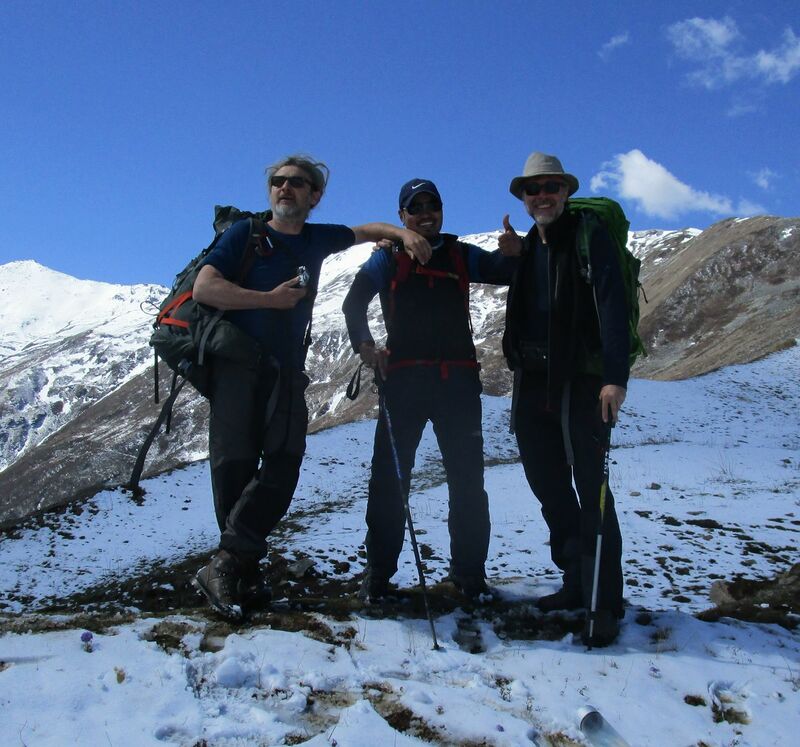 We were accompanied by super guide Toran whom I knew from my previous “Tumlingtar to Renyo La” trek in 2015. 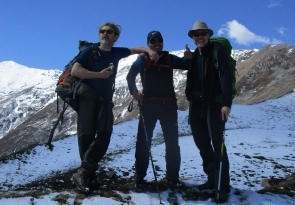 It keeps amazing me how Jagat, Toran, the porter go through great lengths to make the trek as pleasant as possible and how adequately they react when unforeseen events occur. Hence ‘Himalayan Leaders’ is a travel agency to be recommended! Namaste, Didier.